Doral city council members are expected to discuss an ordinance that would stop city streets and other public places from being named after living people at a meeting Wednesday night. 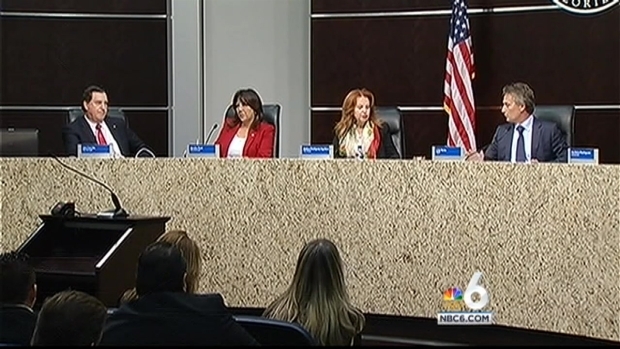 The meeting comes a day after the Hialeah City Council approved a resolution to remove the name of former Mayor Raul Martinez from a municipal property, the Miami Herald reported. The Doral ordinance would prevent the future naming of public spots, but all places that are currently named after living people would be grandfathered in. Doral City Manager Joe Carollo said he's supported this policy since he was Miami mayor. The Doral City Council unanimously voted to make Christine Fraga the new vice mayor Wednesday night, as Mayor Luigi Boria and City Manager Joe Carollo continued their public feud. NBC 6's Steve Litz reports. "Unfortunately, in Miami-Dade County, we've had a history of naming streets after people that we later find out have had some problems," he said. 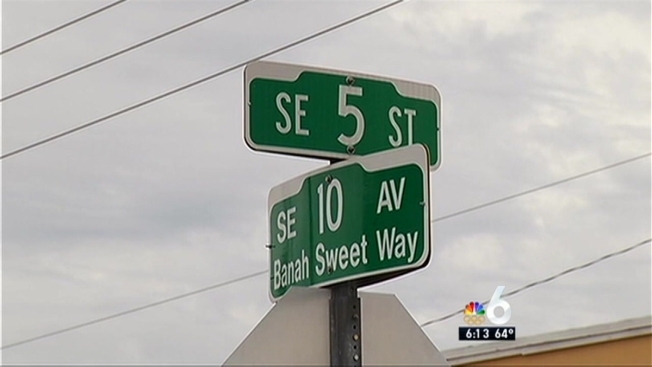 For example, a street called Banah Sweet Way was named after a sugar company which went bankrupt after its founder was convicted of cocaine trafficking. Another street was named after Miami-native Jose Canseco, a slugger disgraced in baseball's steroid scandal who allegedy hit his wife. Among others: UM's Alex Rodriguez Park and Miami's Miller Dawkins Park. "I personally think it's a better idea not to do that until later on, even though I respect those who feel you should try to honor people while they're still alive," Carollo said. The Doral City Council rebuffed an attempt by Mayor Luigi Boria to fire City Manager Joe Carollo Wednesday night as its members supported Carollo in a 3-2 vote of confidence. The mayor summed up his argument against Carollo before the vote. Hialeah approved an ordinance similar to Doral's proposal in November, but Tuesday night's vote applied to buildings and other places that were already named. In addition to taking Martinez's name off City Hall, an apartment complex named after Martinez's wife will have her name removed. A park named for former state Sen. Roberto Casas will also be stripped of its name, the Herald reported. The resolutions were sponsored by Mayor Carlos Hernandez, who defeated Martinez in the 2011 election.